I have made a gallery, where can I add the photo's? Can plugin be used only for gallery? Or does it have file manager for managing all media files? Right now this plugin can be used only for image and video galleries but we can improve this plugin according to your requirements. In this case we will charge you only for the work that we will do. We want the gallery to be expose at the main header of the website (the same way it shown in the demo) how can we do it? You should specify the widget zone if you want that your header looks like on the demo site you should enter the "header_menu_after" text into the widget zone field. 1. extract the version of the Image Gallery plugin. 2. copy the plugin folder into your "nopCommerce\Plugins" directory. 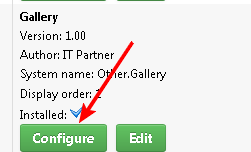 9. enter header_menu_after in the Widget Zones property. 3. import the XML file. 5. click "Add new gallery item"
5. click "Add new image"
Will I have access to cshtml files in case I need to change something? Yes, you will have access to cshtml files but it will be better if you override gallery views in your theme. Is there a trial version that I could use before buying? We provide you with a demo website where you can test everything before buying(http://noptestsite.azurewebsites.net/Gallery).